If you have played any games seriously over an extended period within the last 20-something years and you don’t know of Square-Enix (formally Square and and Enix independently until they merged back in 2003), Final Fantasy, Dragon Quest, Kingdom Hearts or any of their other popular (and not so popular) roleplaying games (RPG) please submit your name and address for immediate crucification. 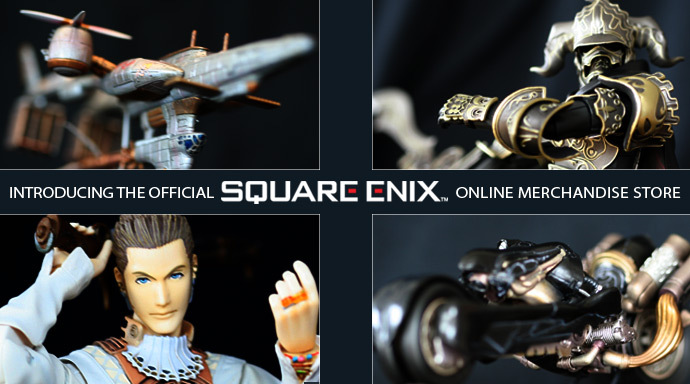 Square Enix’s products especially Final Fantasy is well known and easy ranks as one of the top 10 franchises in gaming ever with followers and fans numbering in the tens of millions. Well those millions of fans will soon have a official online store in the west to shop for various products related to all their RPGs. Hmmm makes you wonder what took them so long eh? Well who knows maybe one day I’ll pick up a thing or two from the store and show them off on my blog, I am a big FFVIII and FFIX fan so I’ll be looking for something related to my favourite characters from that series, off my head now I am thinking Ultimecia and Vivi. How can you be a serious gamer and not know about SquareEnix?